MatrixBrute is arguably the most powerful analog monophonic synthesizer ever ! As flexible as a modular system but offering presets, MatrixBrute is a dream machine for everyone interested in creating a sound palette of their own. 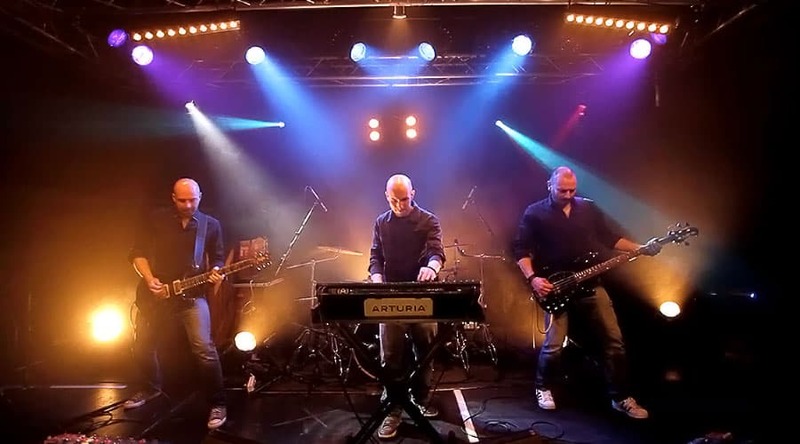 Take the MatrixBrute show on the road! 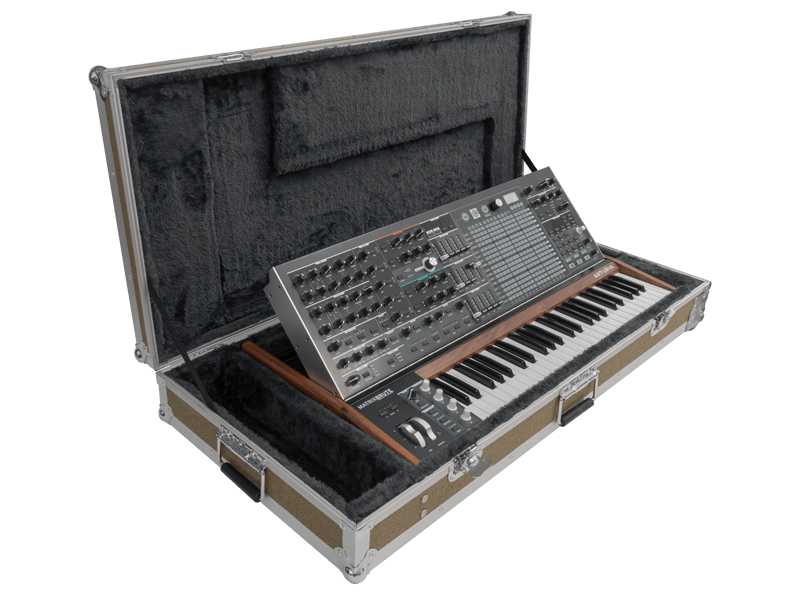 For a limited time, all Arturia MatrixBrute synthesizers will come with a perfectly fitting, aluminium framed flight case for portability and total peace of mind. MatrixBrute is an analog synthesizer that redefines a class of performance and studio synths that has not been matched since the glory days of the 70’s and 80’s. Designed to be flexible and fun to use, evocative and awe inspiring, and most importantly, a world-class musical instrument; the MatrixBrute gives you the depth you need to design and keep inspired for years to come. The goal was to create a synthesizer with the flexibility of a modular but at the same time have it be intuitive and programmable for the live and studio musician. 1:1 knob and button interface for ease of use; pure analog sound with the fattest oscillator in the industry; two filters based on the original designs of Dr. Bob and Nyle Steiner, but taken to new levels; real analog delay effects on the output and the eye catching matrix modulation. All these features and more add up to create a landmark electronic music platform. So what does MatrixBrute sound like? The Matrixbrute is obviously an amazing looking synth but as they say, looks are not everything. The heart of the MatrixBrute is sound; analog sound; huge, pure, awesome, delicate, wild, melodious, nasty, ostentatious, dramatic, amusing, ferocious, and even sophisticated sound. The foundation for any great synthesizer requires great oscillators. We have them in spades! 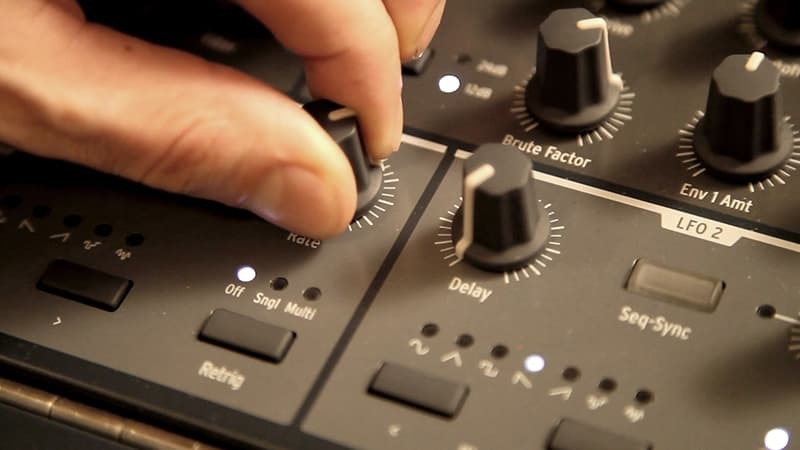 The MatrixBrute has two ‘Brute style’ oscillators, each with its own sub oscillator and the wave shapers that made the Minibrute the new standard in analog synths. With the analog UltraSaw you can make this single oscillator sound like three detuned sawtooth oscillators. The Metalizer on the triangle wave can take your sound from mello to extreme. The sub-oscillator with its waveform control adds low end beefy goodness. We also give you a third oscillator that has sine, triangle, saw and square waveforms. This unique oscillator can be used as an audio source and as a modulation source at the same time. We have added the most advanced Noise generator on a production synth ever. With white, pink, red and blue noise colors, you can create all kinds of new sounds. The noise generator can also be a modulator to add some dirt to the oscillators or filters. The AUDIO MOD section allows you to create complex audio modulations. You can route oscillators to other oscialltors to create dense cross modulation sounds as well as routing oscillators and the noise generator to filters to add some more grit and grime into your sound. The soul of a synthesizer is the filters. We decided to give the MatrixBrute two souls. 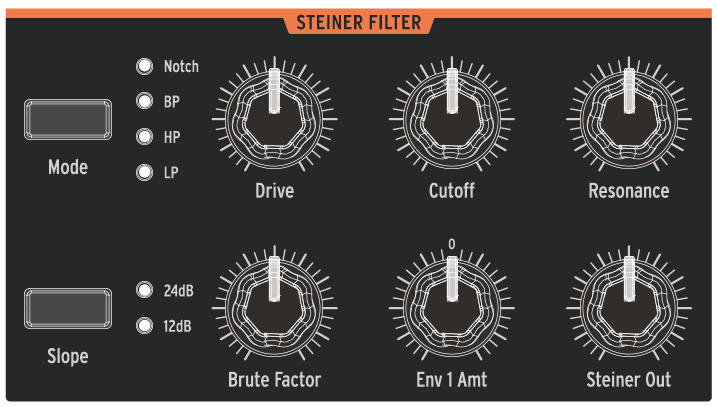 The Steiner-Parker multimode filter that we are known for in our MiniBrute and MicroBrute, has been brought back but this time we added our own flair to it. We added a DRIVE control to thicken up the filter sound. On top of this we changed it so that the slope can be 12db per octave, like the original, or 24db per octave for fatter sounds. 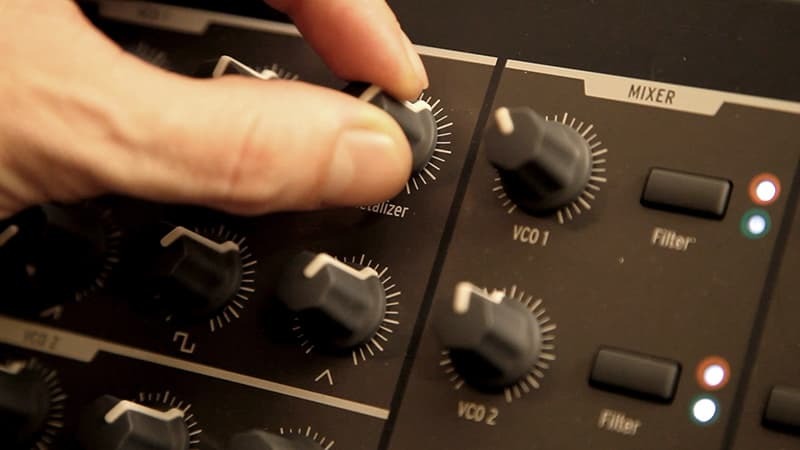 The most famous filter used in synths is probably Dr. Robert Moog’s transistor ladder filter. We have brought you our version of this classic sounding filter with a new DRIVE control, 12 and 24db per octave slopes and LOW PASS, HIGH PASS and BAND PASS modes. These two great filters can be set up to be in series or parallel modes multiplying the possibilities. A single offset knob allows you one control access to both filters for unheard of before sweeps. Undeniably the matrix is probably the first thing that caught your eye. It is big and brash and bold. Part routing system, part sequencer and part preset recall grid, the matrix is undoubtedly the most exciting thing to hit the synth world in a while. In sequencer mode the matrix becomes a 64 step sequencer capable of making awe inspiring melodic patterns. The sequencer supports Accent and Slide steps and has a separate function that gives you a different CV on each step that can be used as a modulation source. The possibilities with this as both a melodic and modulation source will inspire you for years to come. When in a live situation, you need to be able to load presets quickly and easily. The Matrix can be used to instantly choose any of the 256 on-board preset memory locations. Simply press a button and you are there. No scrolling through lists or dealing with tiny displays. Pure performance pleasure. Modulation sources give life to your sound. They animate it and give it dimension. We have included 3 LFO modulation sources. 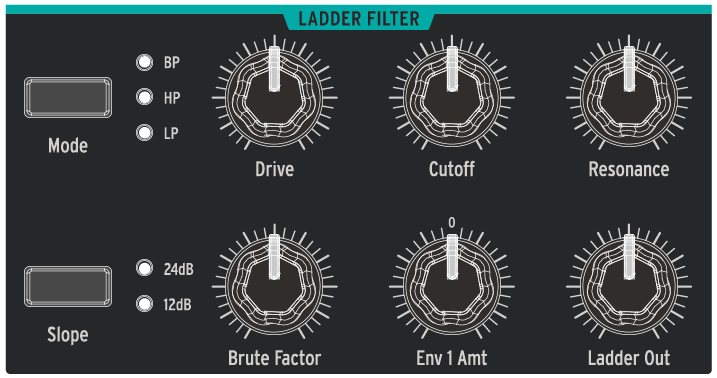 LFO’s 1 and 2 give you a vast array of waveforms to choose from. These LFO’s can also sync to the sequencer or MIDI clock so that you can twist and bend your sound in time to the music. The 3rd LFO is part of VCO 3 and has the ability to track the keyboard for sounds that change as you play up and down. 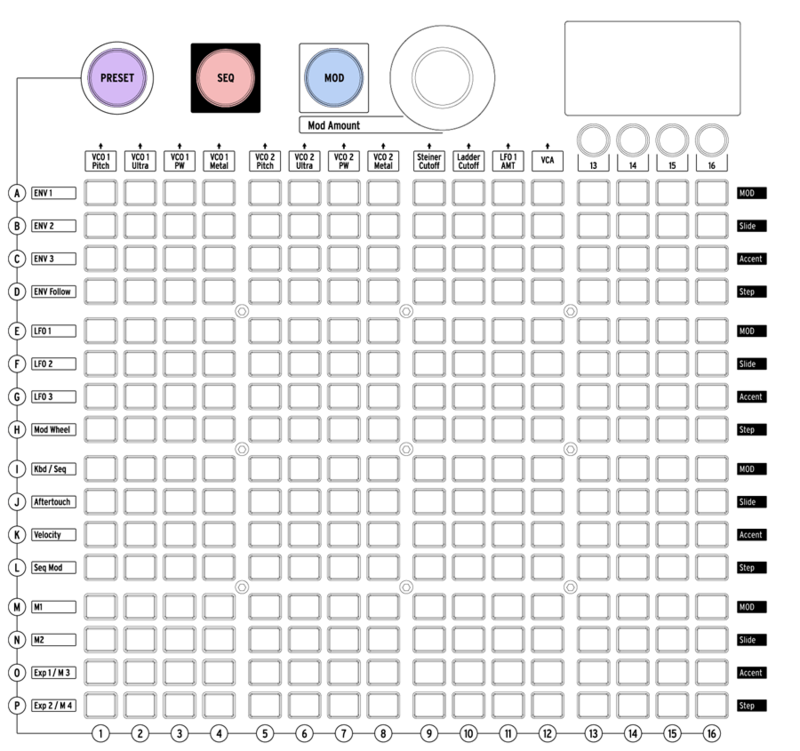 3 Envelopes are also included to give you time based control over filter, VCA’s or any other parameter you want to route them to via the matrix. Our hyper-fast punchy envelopes will allow you to create hard hitting bass and lead sounds. Draw them out and they become soundscape creating time machines. Lastly a good synthesizer is part of an ecosystem. One that allows you to work with other devices, and to interconnect modules using industry standard protocols. The MatrixBrute excels in this area. With 12 CV inputs and outputs that allow you to tie into the matrix, you can use Eurorack standard modules to add even more flexibility to MatrixBrute. 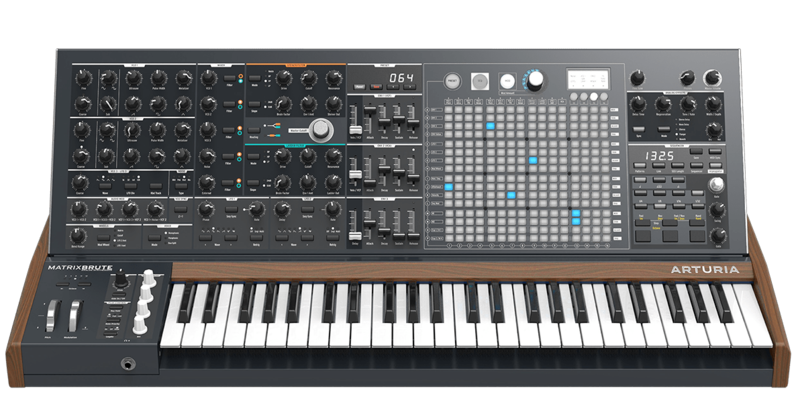 Imagine being able to plug in a boutique company modulation source and controlling the powerful MatrixBrute synth engine. Imagine using sources or macros in MatrixBrute to then control multiple destinations in your custom modular synth. Imagine bringing external audio into the mixer so adding even more tone generating capability is just a plug away. Syncronize your vintage drum machines or external sequencers with the DIN/clock sync in and outs. Connect to a computer using USB or to MIDI equipped sound modules. External pedal controllers like footswitches or expression pedals can also be used to give you more performance options. 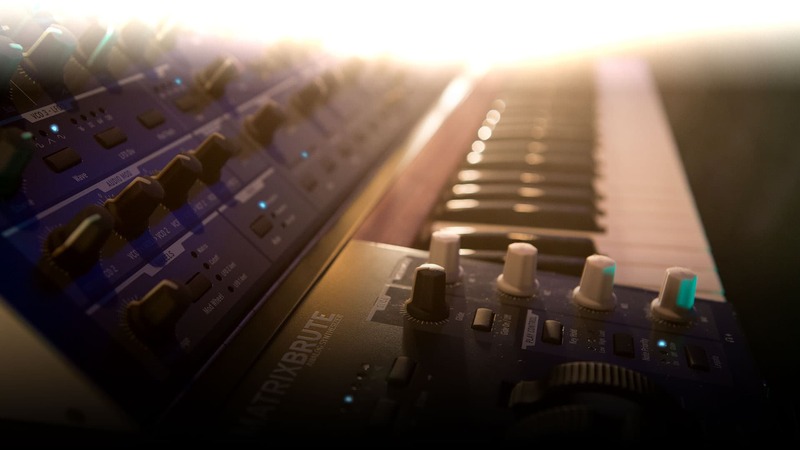 Matrixbrute is the pinnacle of analog sound and connectivity. A synthesizer is meant to be an interactive musical instrument. At the center is the keyboard and our 49 note velocity keybed with aftertouch gives you a great platform for playing. But playing the synthesizer is more than just pressing keys. We have the standard pitch bend and mod wheels that you will find on most synths but we have added 4 macro knobs that can be assigned, and routed via the Matrix, to any of the modulation destinations. This allows for single knob control of up to 16 parameters. Using the macros will take your performances to new levels. On top of this we have an amazing sequencer and arpeggiator for making musical patterns or tempo sync’ed modulations. Synthesizers and effects can be a touchy subject. Too often companies put poor quality, poor sounding digital effects at the end of their analog audio chain which leads to bad overall sound. We have built in 5 high quality true analog effects that will be sure to impress. 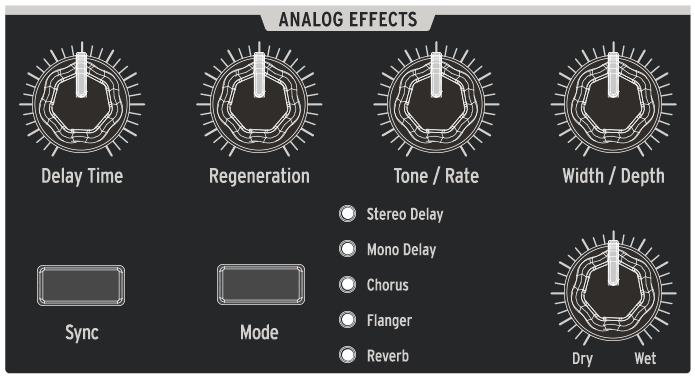 From stereo delay and mono delay to chorus and flanging as well as a unique multi-tap reverberator, our new analog effects are the perfect finish to this impressive sound chain.